My fall tatting project ... make all 24! Since I've been devoting myself to other kinds of fiber projects lately I really haven't been tatting too much, and in all honesty I haven't been feeling much tatting mojo lately, but... I do miss having a small project to throw in my bag when I'm on the go and is easy to pull out and do anywhere. 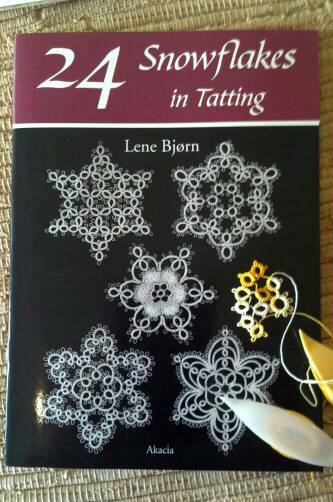 So, I've decided to tat my way through the 24 Snowflakes book by Lene Bjorn. I decided that I'll be using my favorite tatting thread for all the snowflakes, Olympus, size 40. Each one will be in a different color, though. I started number one today (the humble beginnings seen in the pic above) and I'm hoping to get all 24 done for my Christmas tree! I'll keep you posted on progress!